In February, my family was blessed to be included among those families who would reviewing Adventus MusIQ HomeSchool. The is a program to teach the whole family how to play piano! The Adventus music programs are adaptable for anyone pre-school through adult! I also have been interested in increasing my piano skill. I had some instruction in my teens, al beit very little, from my grandmother. I can follow music, but have never been able to read it (kinda like knowing a few sight words but not knowing phonics or the alphabet). The Adventus programs can be run on almost any midi-capable keyboard, if you already own one, or a compatible keyboard can be purchased from Adventus. We already owned the keyboard, so we purchased a needed adapter to connect our keyboard to the computer making it midi-ready. I received the downloads and anxiously awaited the midi-adapter from Amazon.com. Then the finally arrived and, splat. I couldn't get started. I need to tell you, this product has been the most difficult to get started of any I have experienced. But I also want to make clear that the vendor worked hard to help me succeed. They are a small company, though. They are not available 24x7. But when they are there a real person answers the phone; a person works to talk you through your issues. If the person available can't help you, they make sure you connect with the person you need to talk to. They got me through the steps needed to get the program to recognize our keyboard, and helped me learn how to get started. We were asked to use and review at least one level of one of the products. My son having no formal training, I wanted to check out Children's Music Journey (CMJ) first to make sure we didn't miss anything. Adventus had created an informal instructional video just for the Crew members to help us get going with the product. It is not that easy to figure out, even with the video. There is a configuration to the keyboard, different with each program, that is supposed to need to be run only once. There is a specific order the devices need to be turned on in order for it to work (plug in piano to midi cord and midi cord to computer; turn on piano keyboard; open selected Adventus program). Then, there is a specific part of the program to start at, which is almost, but not quite obvious. Without the video I know I would have been on the telephone with customer service for them to walk me through it all. Even having the video instruction, I ended up talking to Adventus because things were just not working. They are a small company located in Halifax, Canada. They are open reasonable hours (for me, since I'm on the east coast of the USA), but when they are closed, they are closed. But I loved that every time I called the telephone was answered by a real person! And every time I called, they listened to my situation and walked me through to a solution of the situation. However a visiting pre-school friend spent several hours learning with Children's Music Journey 1 and was absolutely delighted with it! She would like to come back and learn more. So the Children's Music Journey was too easy for us, so we switched to the Piano Suite Program. It took me awhile, but this is where I found my niche (as in a good fit for me). I have been working on Piano Suite for a little over two weeks (the other time spent in set up and then in CMJ). I am real pleased with the progress I have made, even though I am clearly just at the beginning. walks older students through the different types of notes (whole note, half note, etc. ), how to count beats for the different notes (on 4:4), and note identification. It introduces the different clefs (G clef, F clef, the Grand Clef). The student learns to read notes (Every-Good-Boy-Does-Fine etc.) for the lines, and then the spaces of the G Clef. That is where I got to when I had to slow down and drill, drill, drill. Can't go forward yet because I'm still cementing it into my brain. But I'm sure it then moves to learning the note for the F Clef. When I work on the program the computer program can tell what I am playing on the piano, which is so cool! I am still at a place where I am only playing one note at a time, not chords. So far I just love this program, and I truly intend to continue working with it long after this review is over. This is an incredible program, but is very difficult to get started with. In spite of the fact that the Keyboard Configuration Wizard is supposed to only need to be run once, I have regularly started the Piano Suite only to find the computer wasn't recognizing the keyboard. I had to run the Wizard again, turn everything off and on again (think reboot), and then it would work. I was beginning to detect an issue with the program that I do not yet know how to resolve. As I am playing the notes from one finger to the next, if I do not pick the first finger up off the key before I push the next key down, it doesn't recognize the 2nd keystroke. So if I am playing five notes in a row and it never recognized the 2nd note I played, the program stopped at the 2nd note waiting for a "right" note to be played, while I'm merrily playing along not realizing it stopped. Not sure what else to say about that one yet; not yet resolved. My keyboard seems to be flat compared to the notes coming from my computer. Can electric keyboards be flat? Can that be fixed? When I play, a note sounds from both the keyboard AND the computer, but the notes from the computer are delayed behind the notes on the piano. Very strange, and distracting. If I turn the computer sound off I won't be able to hear the lesson; if I turn the keyboard sound off, the sound will still be coming delayed from what I hear. Hmmm. But I really have wanted to learn to read music, and this program and its games are incredible for that. I'm learning. My son stopped trying and refused to work with the program any more. I continued to work, and sometimes he would be in the room and come over to see what I was doing. I am hoping he might give it another chance sometime in the future. The customer service with this company is top notch! They are available, responsive, and knowledgeable. I thought they were great. So, overall, the start-up was difficult, but I am glad we got through it and are up and running now. I am hoping my son will learn to play and read music, but regardless, I am very happy that I now have this opportunity myself to learn to play and read music. This is an excellent program, and if you have a budding musician in your life and are on a limited budget, this is an excellent option for you. 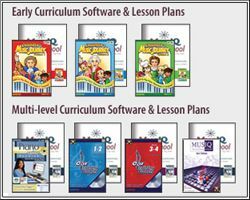 It includes an amazing variety of levels and topics and games, and can be used with all the children and adults in our family who want to use it (as long as they share the computer the program is downloaded to). I give this product 5 stars out of 5 for being a favorite addition to my home school's music program. Give it a try! Read more at MusIQ HomeSchool. If you have any questions, give them a call. A real person will answer! A keyboard can easily be transposed by hitting a button or by changing settings, and this could mean that when you think you're playing middle C, you're actually sending a higher or lower note to the computer. Look at your keyboard manual to find out how to reset your keyboard quickly to remove any transposing. For the keyboards supplied by Adventus, turning the KB off and then on again will do the trick. The main issue I have is like when I am playing one handed and I play finger 1-2-3-4-5-4-5 , if I do not pick finger 1 up before I push finger 2 down, the computer doesn't detect finger 2 going down, something like that.